Picture this: A classroom bustling with students engaged in a variety of activities. On one side of the room, the teacher mingles with a group of students who are working on a collage. It is spread out across a wide table and students are discussing, in English and Spanish, where to place the different items. The teacher meanders by, a student asks for some advice in English, and a short discussion takes place. A few minutes later the same teacher approaches a student sitting in a bean bag chair on the floor reading a book in English. The student asks the teacher, in Spanish, about the meaning of one of the words in the book, and together they talk about the word and its context in the sentence. This easy movement between two languages is happening in many bilingual classrooms throughout the United States. Not only do classrooms such as these help non-English speaking students learn English, it also helps native English speakers learn a second language. Bilingual classrooms give students the opportunity to become truly bilingual. Students in bilingual classrooms should be provided examples of both languages in as many ways as possible to ensure that language exposure is as balanced as possible. An excellent way to do this is to ensure that students have access to quality bilingual resources, especially bilingual books. Better language skills: Researchers agree that a solid foundation in the home language will help facilitate the acquisition of additional languages. Students who learn to speak and read in more than one language will be able to transfer skills and knowledge between languages and can achieve better fluency in both languages. Bilingual books provide students with the opportunity to read in their stronger language while at the same time learning vocabulary and sentence structure in the second language. Literacy affirmation: Students who feel successful reading in their first language will feel an increased enthusiasm to try reading in additional languages. Since bilingual books provide sentences in both languages, students can more easily see similarities between words and be able to compare/learn sentence structure, making them more eager to try out their newfound literacy skills in a second language. Value of both languages: When students see their home language written side-by-side with the second language, they will identify both languages as being equally important. This is a key element in helping dual language students feel that their language is respected and appreciated. Quality writing: When students are given well-written bilingual books, they have the opportunity to absorb quality literature in both languages. This is especially important for bilingual students who are developing their literacy skills in more than one language. Quality bilingual books encourage students to build a strong vocabulary in both languages. Positive cultural examples: Aside from the linguistic benefits, bilingual books give children the opportunity to see a variety of cultures portrayed in a positive light. Students may feel a personal association with specific cultural events, a character’s skin color, clothing items or foods. Identifying with the characters in these books may help students from diverse backgrounds build a positive self image. Intercultural competence: Many bilingual books portray social norms that may apply to specific cultures. Depending on the story, students are given the opportunity to learn how to act and respond appropriately in a variety of situations through the actions of the characters. Stories that speak to these subtleties in more than one language can help students feel more comfortable with unfamiliar cultural norms. Cognitive development: Research shows that being exposed to more than one language builds a better brain. This is especially true for children who are growing up with constant exposure to more than one language. Schools can help support these cognitive benefits by providing as many bilingual resources (spoken and written) as possible to students. Social skills and cooperation: Children who are familiar with vocabulary and meanings in one language can share this knowledge with their peers. This fosters cooperation as well as social skills and helps students form bond with one another. When students can help others in class understand their language’s vocabulary and grammar, they will feel more empowered to participate in the classroom. Literacy enjoyment: The more bilingual children enjoy reading (in either language) the more their overall literacy skills will develop and strengthen in both languages. Bilingual books for young children are engaging, interesting and captivating. Bilingual students look forward to reading good stories over and over again in both languages, which in turn strengthens their literacy even further through repeated exposure. Multiple uses: A wonderful benefit of bilingual books is that teachers can share the stories with students in a variety of classes. For example, students can review the story in one lesson in English, and then read and discuss the same story in the second language in a separate lesson. 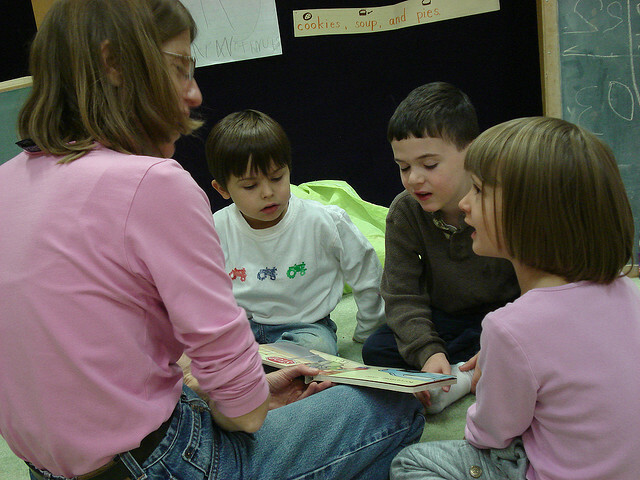 Teachers and librarians can provide bilingual story times and thereby involve students with different home languages. Some teachers are reluctant to use bilingual books in their classroom because they worry that students will only read the words in their stronger language. However, when used appropriately, bilingual books can actually help students master their second language more quickly. They key is to use bilingual books in a variety of contexts (reading out loud, discussing the story, writing about elements from the story, etc.). Most students in bilingual classrooms are eager to learn to read bilingual books in the second language when given the chance. With a supportive, encouraging environment to explore, language learning is viewed as a fun activity for young students – as it should be! Do you teach in a bilingual classroom? How do you utilize bilingual books and resources in your classroom? I enjoy what you guys are usualkly up too. Such clever work and coverage! Keep up the amaziing works guys I’ve added you guys to my own blogroll.